The flowers. The workshops. The Weddings. The Peonies. The Farmstand. 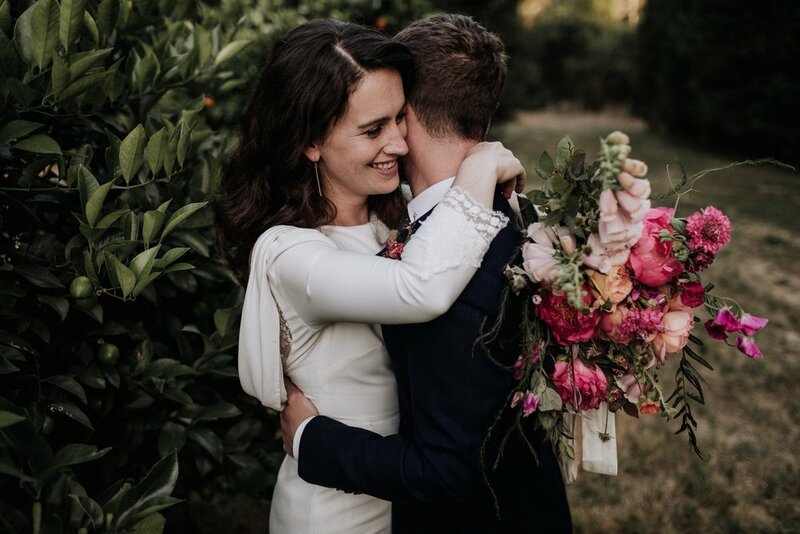 The 2018 farm and wedding season was bright, busy and productive here at B-Side, and I want to take some time to share some of our highlights with you before charging ahead with 2019 plans. On a farm, winter seems to be the only time available for reflection. Not only are we just too busy in the height of the season, but there’s a thing, and I swear it’s real, called Farmer’s Brain, and it takes hold by about mid-June and doesn’t let go til, well, any day now, fingers crossed. Any chance we have at reason, thoughtful reflection, or big-picture planning just flutters out the window into the hot sun. So, let’s reflect now, while we still can. (So dramatic). First for the flowers themselves. The season began, as it always does, with ranunculus. 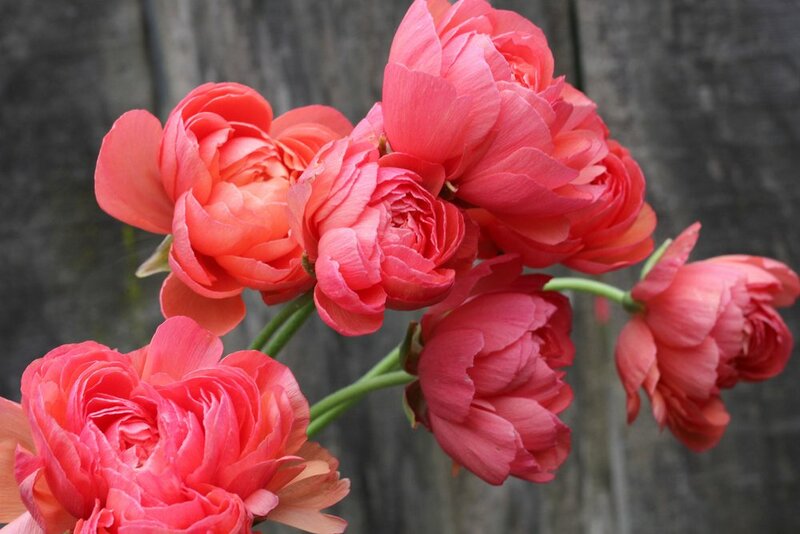 This was our best ranunculus season yet, and our tall, pillowy blooms flowered for a solid six weeks with abandon. 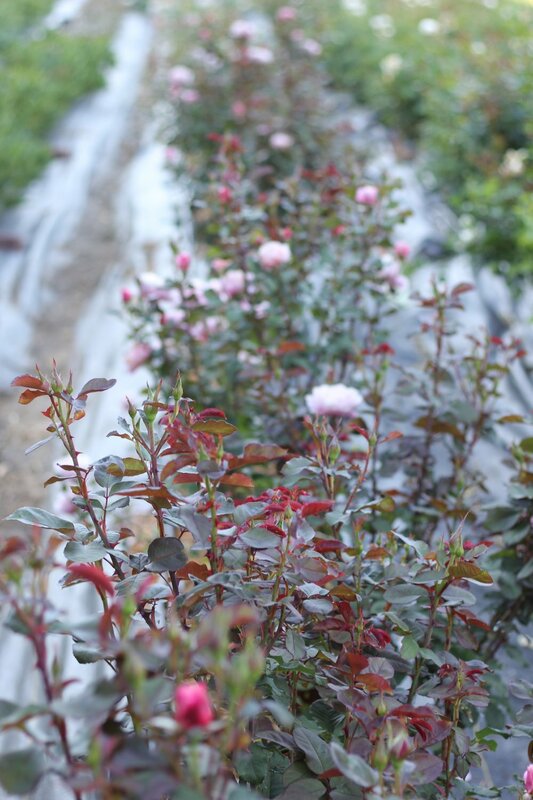 We mainly grew Italian types which, while more pricey, really stand out as being just a little bit more special than other more common varieties on the market. For some reason, I ended up with about five different shades of pink. There was light pink, baby pink, ballerina pink, candy pink, and, on days when I was especially sick of them, Pepto Bismal pink. I didn’t even think I was a pink person, but being swallowed up in it every day turned out to be a pretty cheerful existence. The crop wasn’t without its challenges, though. The 2017 Santa Rosa wildfires that ravaged our area and burned just miles from our farm, along with a particularly early killing frost on October 9th, caused an abrupt end to our season. This meant that rather than dwell on fall crops and try to eek out any last dahlia or mum blooms through October and November, as we would usually do, we jumped into fall cleanup as soon as the smoke cleared the air. 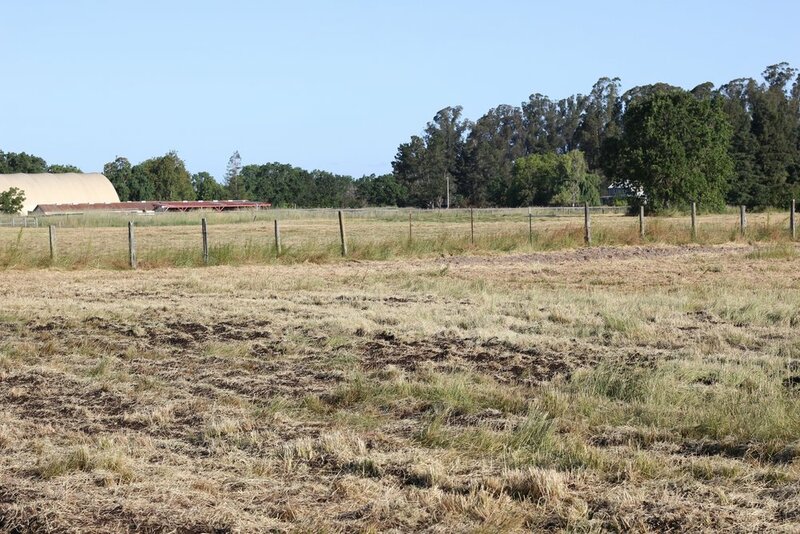 Oddly, amidst the coughing, sadness, and worry for our neighbors, we actually were able to get the farm cleaned up and beds turned over in time for winter rains. This also meant fully prepped ranunculus beds come early November. So, feeling on top of things for once, we planted early. The result was a super early crop, hitting its stride mid-March. In some cases it’s great to be one of the first to market with any particular crop. 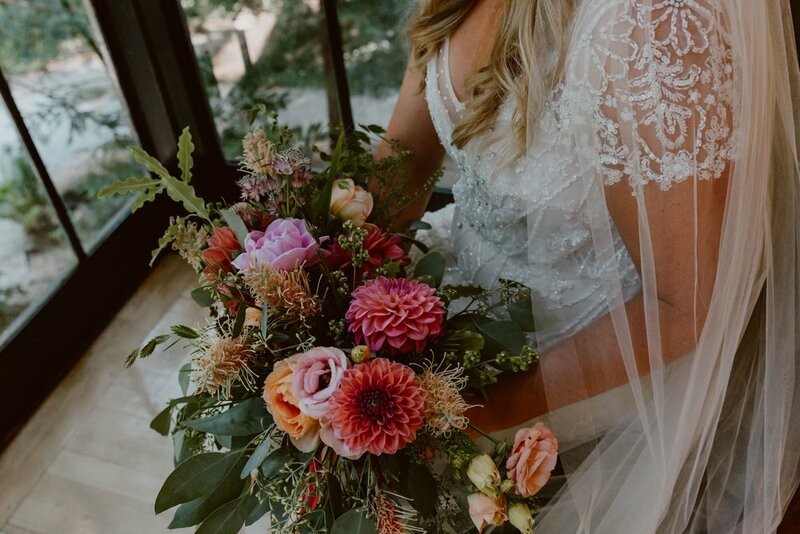 But my flower sales rely so heavily on seasonal, outdoor wine country weddings, so in short, it was hard to sell all these beautiful ranunculus before local demand really began for the season. B-Side’s first summer wedding wasn’t even until mid-April, when the ranunculus was already on its way out. It’s a tricky crop in that it needs a long, cold period to establish, and starts to decline as soon as temperatures are in the 70’s. Plant too early and you’ll have winter blooms that don’t sell. Plant too late and rising spring temperatures cut short their bloom period by weeks or more. In spite of the high expense of growing them and these timing challenges, it’s hard to deny that they’re just so exceptional. Spring last year boasted some other great flowers alongside the ranunculus. Geum, a shade-loving, low-maintenance perennial has become an important spring crop for our little farm. We grow just a small section of a bright orange variety that all the florists, myself included, are oddly drawn to. There’s just something about these tiny bright little flower heads that pull you in. On top of that, it’s not something that ships or travels well, so I’ve seen a lot of geum at places like the SF Flower Mart that has lost most of its petals and looks really worse for the wear. When people see how well ours holds up, they keep buying it every week until it fades in summer. We planted a whole, 120’ bed of bearded iris late in 2017, which wasn’t a small investment, and it surprisingly put out a lot of flowers here in its first year. 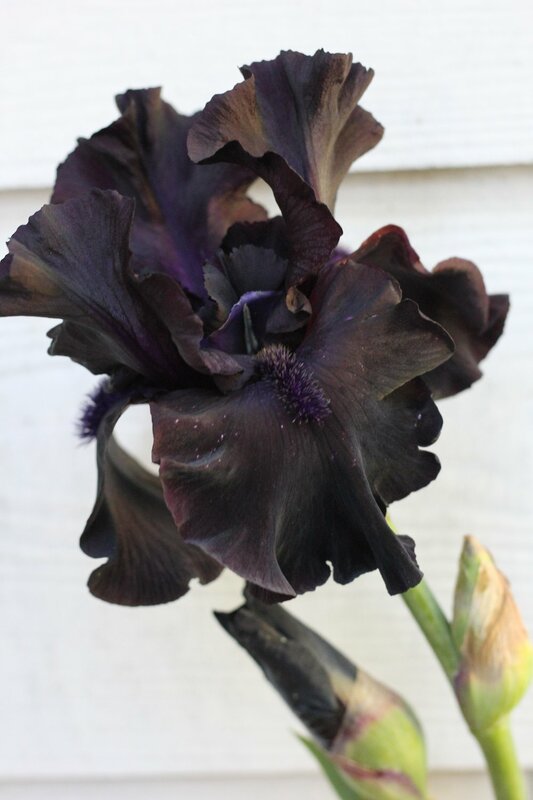 The coolest colors we planted, a deep black and a coffee beige, have yet to really put on a show. Ironically, it’s the bright saturated purple that really bloomed its head off. I’m not a purple person. But I don’t hate em. If there’s a sexier beast of a flower than columbine, hiding in English gardens everywhere, than I haven’t found it. It’s a tricky flower to mass-produce, as the petals shed pretty easily and it would be hard to transport it very far without some damage. But I sell every stem of my tiny patch, with florists eagerly asking me about it as soon as I post the first picture in spring. It’s dainty, ephemeral, elegant, and tall. It’s perfect. 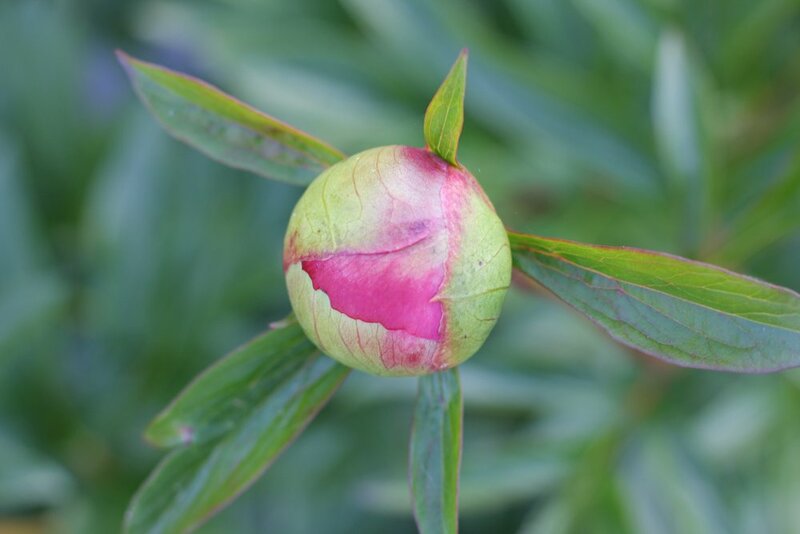 I’ll have more to say about peonies in the coming years, hopefully a lot more (see below!). But this year was the first that I had any peony flowers to sell from the small patch in my first field. It was hard to sell them as I just wanted to hoard them all for myself. Then again, when I can get around $5 a stem (compared to about $.70/stem for most other flowers I grow), my books would kill me if I didn’t sell at least the majority. This was also the first year that our roses bloomed in earnest. We’ve got about 100 mixed color romantic David Austin types, 25 creamy lavender Koko Loko, and some other odds and ends. 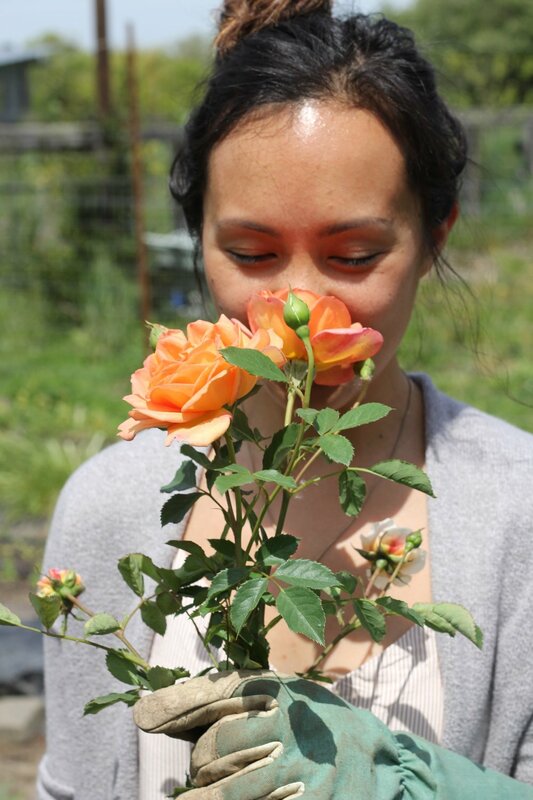 Roses are such an interesting crop to grow. They don’t put out many flowers a year compared to the seeded annuals I first started with on my farm, but each flower they do put out is so valuable and useful in every type of design imaginable. 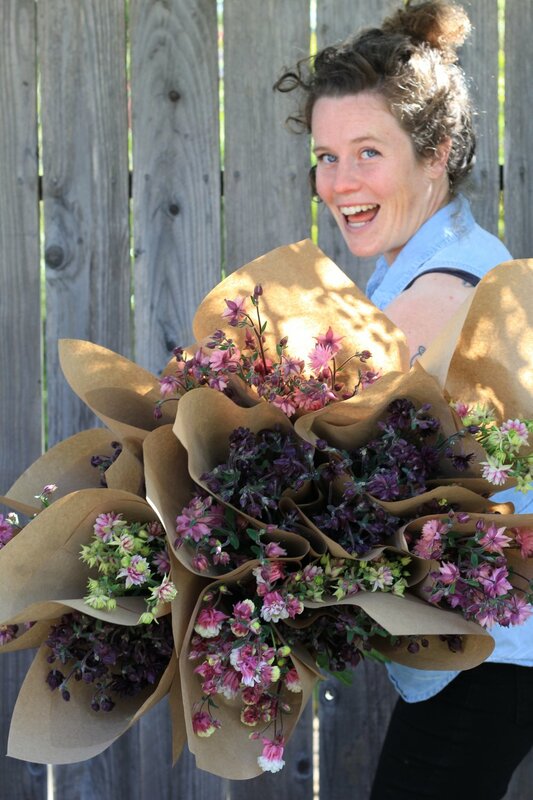 Through sales to florists, use in B-Side Weddings, and providing buckets full to almost every workshop, all season long, we used more stems than I was able to even keep track of. We’ve still got to fine-tune some of the varieties and some of the pest issues (thrips! grrr), but I am SO happy we took the dive and planted so many roses a few years back. 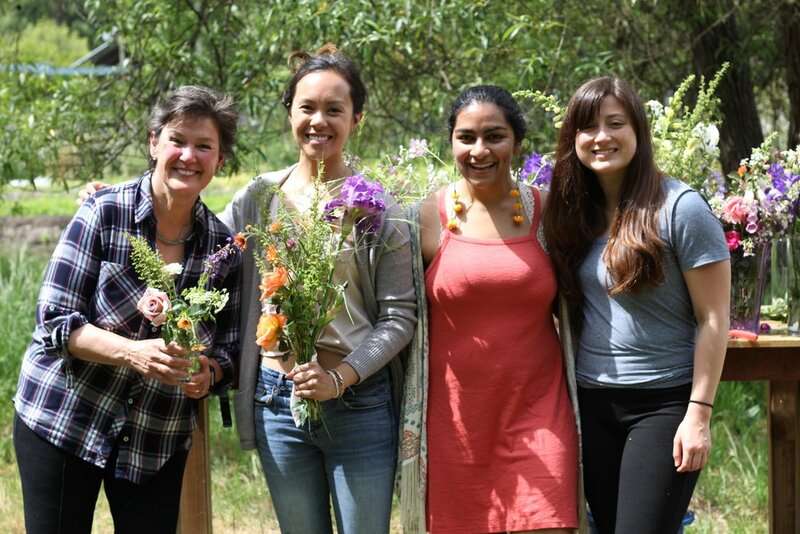 Once the spring flowers subsided, it was all about lisianthus as we waited for the dahlias to bloom. There’s no more useful flower out there than lisianthus. 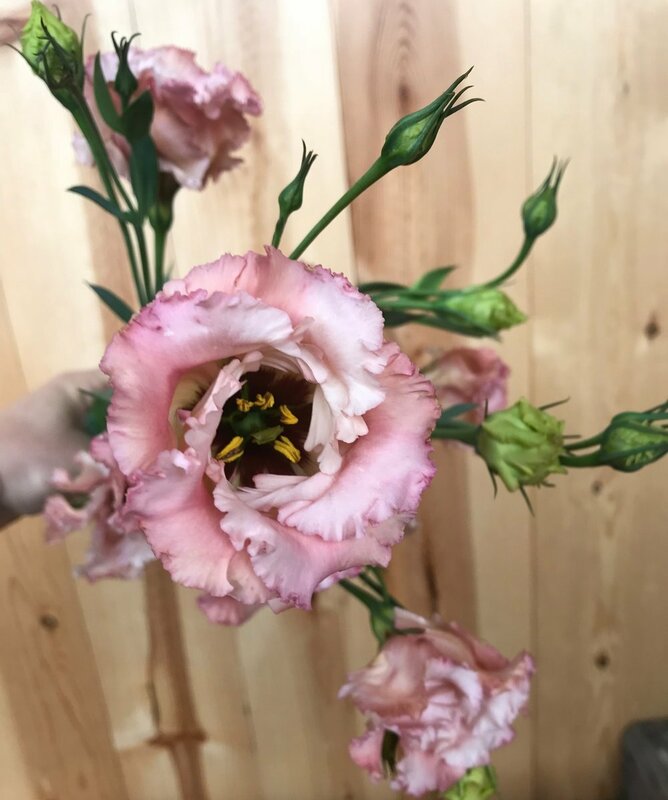 The typical, shipped-in stuff that many florists are used to just pales in comparison to local lisianthus allowed to open a bit on the plant. We add varieties each year (especially now that my friend Bailey started his plug business, bringing more interesting varieties to market for us small growers), and there are few that I haven’t loved. 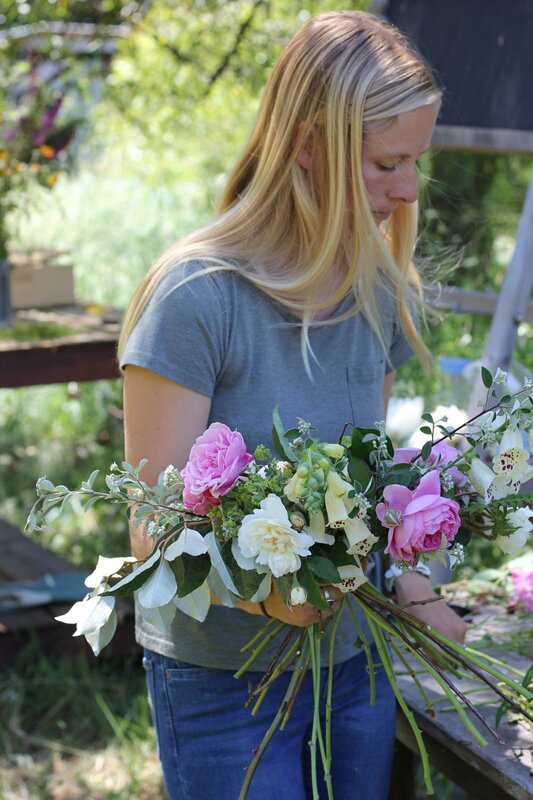 When they’re blooming, we use them in every single design in a wedding, from the boutonniere to the bar flowers. We always grow a lot of dahlias, and as much as I love them, I’m always a little torn about how many to grow. In spite of being unfussy in certain ways, they really do take a lot of work throughout the season. There’s digging up the tubers in the fall, storing them and watching them carefully to make sure they’re not too dry or too wet, planting them out in the spring, staking or netting them so they don’t topple over, and eventually digging and dividing them again in the fall. And for us, there’s the endless battles as we face off with cucumber beetles. These nasty little creatures will eat every single bloom, rendering it useless, unless we intervene. There’s no great solution. We’ve taken to a tactic used by organic growers across the country: organza bags. We place a tiny jewelry bag over every single flower just as they’re about to open up, providing a physical barrier that keeps the bugs from munching. The results are great and we can use or sell most every stem we grow, but it eats up so much labor, and since we can only fetch about $.80/stem for each dahlia (compared to twice that anywhere but California, where the market is full), I’m never sure it’s worth it. But, come on, they’re dahlias. Look at them. I missed teaching, and wanted to host more people on the farm. So last season I planned a lot more workshops - about 12, up from 5 or so the previous year. I used to rent my landlord’s indoor space to host them and was a little hesitant to plan so many out in the open weeds surrounding my little farm, knowing that it would never be quite tidy enough to fit some peoples’ ideal of what a flower farm should look like, but I quickly got over myself. This would have to do, and I was never going to be the type to put excessive energy into tidiness beyond basic safety precautions. Of course, (of course), no one noticed the mess among the colorful, vibrant fields. Sometimes I’m too tired to fully appreciate it, but in moments where I really tune in and listen and watch as people stroll around the fields upon their arrival, the weight of the farm’s ability to create this respite for people hits me, and it renews every urge I had to get into the business of flowers in the first place. It gives people a chance to get out of the city, to feel the sunshine if it’s been a busy week, and to just sort of check out of their regular life. 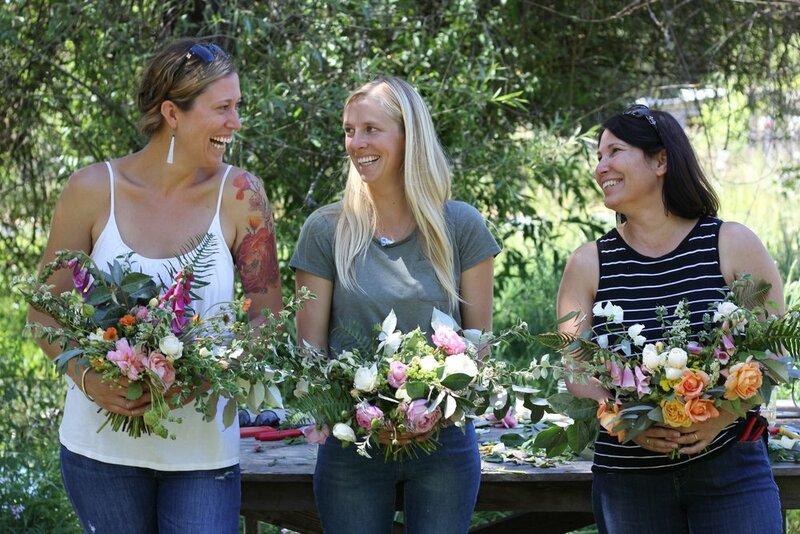 We had a bunch of casual design classes for whoever just wanted to play with flowers, and some more florist-centered ones for budding professionals looking to practice certain skills. Our foam-free arch class was so popular I almost scheduled a second one. I’ll do that this year. I also plan on having more options for people to just come out, hang out, walk around, and pick some flowers to arrange as formally or casually as they want. I won’t provide much guidance or instruction on these and everyone can just do their own thing. What’s the point of this beautiful space if I can’t share it with more people? This was the year of the sweet, involved mother-of-the-bride (and groom!) weddings. I think we had three alone where I worked with the MOB or MOG more than the couples themselves. In some guidebook for florists somewhere, people will caution you against this. But these were honestly really great experiences. 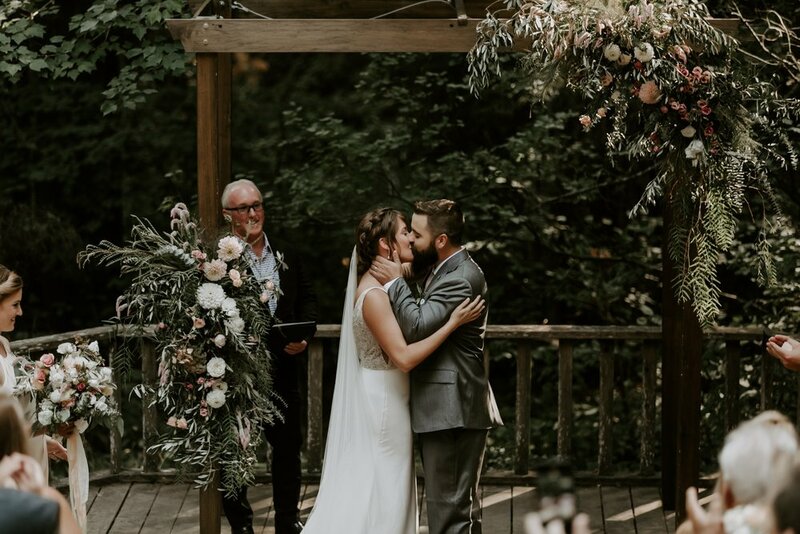 Kayleigh’s sweetheart’s mother was just so delighted that such an exceptional woman was joining their family that she dove into each detail with such love and interest it would make you tear up. 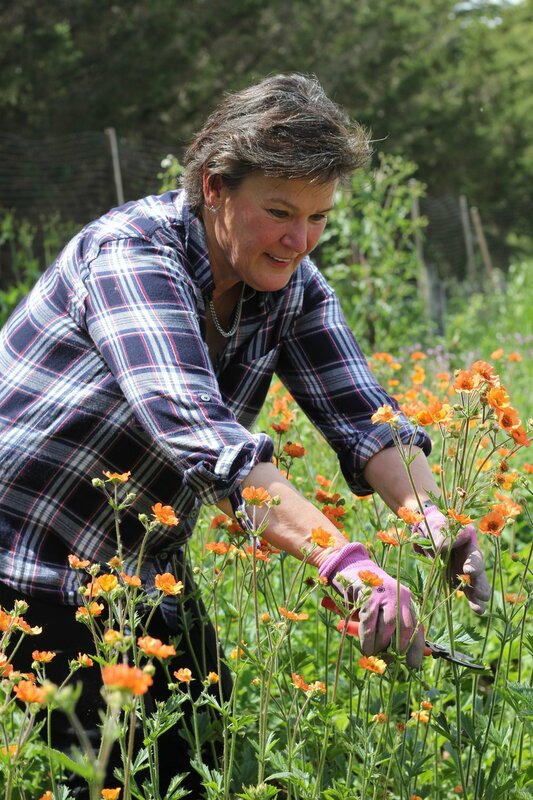 Sasha’s mother sweetly followed along with my farm over the year, asking after me and my crew during fires and storms, truly invested in our farm’s success. 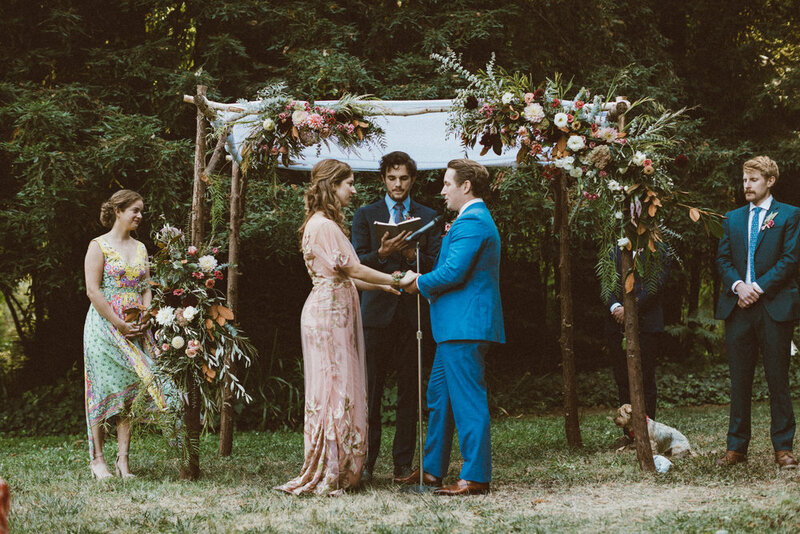 And Eliza’s mom, a landscape architect, carefully showed me around the venues where she had been instrumental in the landscaping, brainstorming with me on what flowers and plants would play nicely off each other during the wedding itself. This was also the year of the celebrity weddings. So that was fun. Every time I hear MGMT or watch SNL now, I blush a little and then quickly try to play it cool. Even when alone. It was also the year of designing the all-out wedding arches I had always envisioned, of finally hiring enough staff, of only agreeing to work for truly sweet couples, and of sticking to our defined minimum rates and maximum workloads to make sure I wasn’t working myself into a stupor. And it worked. We did some beautiful weddings. I’m write more about this in the future as it could take up pages and pages, really, but for those of you who have been following along, you know some of the story already. Tired of wondering whether I could one day lease a bigger farm and finally try out growing peonies at a large scale, I leased a new 1/2 acre plot across town, and made the plunge. A year of planning, a new lease, tens of thousands of dollars, and tons of help with everything from tractor work to laying landscape fabric, this November we planted out 2,400 peonies, in 17 different varieties, from 4 different sources. Now we sit and wait. My boyfriend’s father David (who I affectionately, if not prematurely refer to as my father in law) is the kindest man on earth. This summer he endeavored to build me a farmstand, and it’s been the absolute highlight of my year. It was finished in July and the first time we filled with flowers and hastily threw some hand-painted signs up on the road leading to the farm, I spent practically the whole weekend hiding behind the bushes to see if anyone would stop & shop. They did! Seeing enthusiasm for the stand build through the days and weeks of summer leading into fall brought me pure joy. We sold bunched dahlias, mixed bouquets, and even some potted plants and replenished the buckets daily with fresh blooms. It feels so good to be able to sell to the general public again, as I long ago stopped being interested in spending the day sweating behind a booth at a farmers market. The best thing about the stand (besides the extra income for the farm, which didn’t hurt either!) was the sweet notes my customers would leave me. Every night I opened the guest book to see what new visitors had stopped by and what they had to say. “This is the best example of an honor system I’ve ever seen!” was definitely a highlight, as were weekly greetings from some neighbors I got to know through the stand itself.